Kick off your visit on the 1st (Sat): don't miss a visit to Zona Arqueologica Teotihuacan, then explore the world behind art at Palacio de Bellas Artes, then admire the landmark architecture of Palacio Postal, and finally delve into the distant past at Metropolitan Cathedral (Catedral Metropolitana). On the 2nd (Sun), you'll have a packed day of sightseeing: see the interesting displays at Frida Kahlo Museum, examine the collection at National Museum of Anthropology, then step into the grandiose world of Chapultepec Castle, and finally appreciate the extensive heritage of Zocalo. For maps, other places to visit, traveler tips, and tourist information, read our Mexico City journey maker app . The Route module shows you all the different ways you can get to Mexico City. In June, daytime highs in Mexico City are 28°C, while nighttime lows are 16°C. 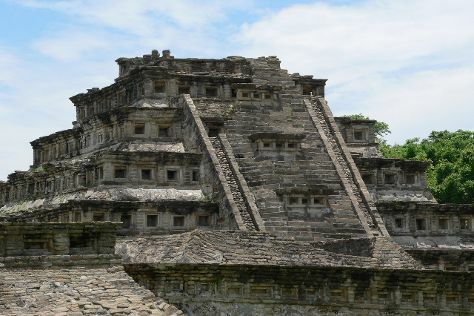 Finish up your sightseeing early on the 2nd (Sun) so you can travel to Papantla. Papantla is a city and municipality located in the north of the state of Veracruz, Mexico, in the Sierra Papanteca range and on the Gulf of Mexico. Start off your visit on the 3rd (Mon): examine the collection at Museo Teodoro Cano, then contemplate the long history of Papantla de Olarte, then identify plant and animal life at Eco Park Xanath - Papantla, and finally delve into the distant past at El Tajin. For ratings, reviews, more things to do, and tourist information, you can read our Papantla route maker . You can drive from Mexico City to Papantla in 4.5 hours. Plan for a bit warmer temperatures traveling from Mexico City in June, with highs in Papantla at 39°C and lows at 28°C. Finish up your sightseeing early on the 3rd (Mon) so you can travel back home.